Not all dairy-free milks does have to be almond. And not all dairy-free milks have to have a creamy or white color. Try this alternative. 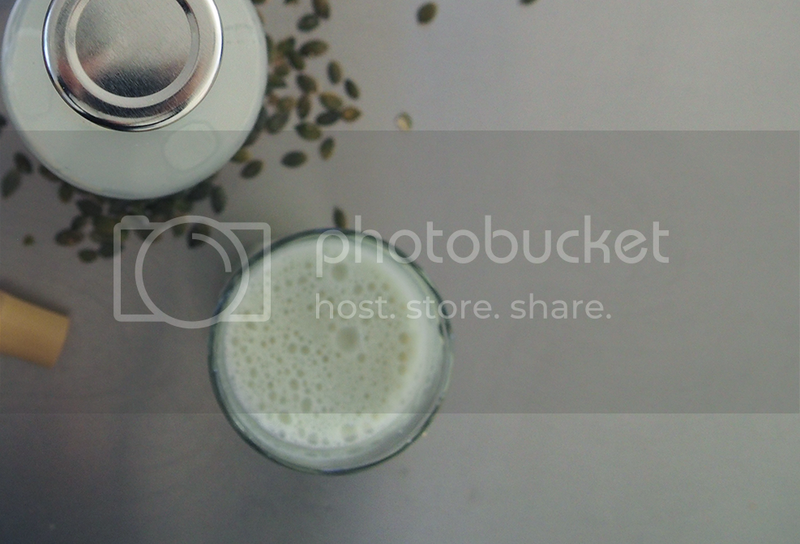 A light green pumpkin seed milk. Its taste has a hint of pumpkin, so keep that in mind when using it. But it goes well with some agave, maple or coconut syrup. I really like this alternative because of the amount of “waste” you discard. Of course you can use almond pulp for baking and such. But if you are like me, sometimes that lovely pulp does not get used and that is a shame, when there’s comes a fair amount from a batch of almond milk. For this seed milk, you only get half a handful. Of course you can save this as well and use it for baking. Soak the pumpkin seeds in water in the fridge overnight. When you are ready to make the seed milk take the seeds out of the fridge and strain them pouring over cold water. Transfer the seeds into a blender, add the water and blitz until the seeds are as dissolved as possible. Strain the mixture over a very fine mesh strain or a nut milk bag.